Sexual conflict arises when divergent reproductive strategies of males and females generate sexually antagonistic selection that can have large impacts on mortality and reproductive output of both sexes. Sexually antagonistic selection is also recognized as an important driver of divergence and speciation, as male-female arms races may escalate in different phenotypic dimensions in separate populations, even in the absence of environmental differences. However, ecology can have large impacts on the evolution of sexual traits, and can even promote their parallel evolution. Environmental selection may therefore constrain the pathways of sexually antagonistic coevolution, although ecology has not previously been considered in investigations of sexual conflict. We provide some of the first evidence illustrating the importance of environmental selection on sexual conflict, using experimental populations of Drosophila melanogaster adapted to two different environments. 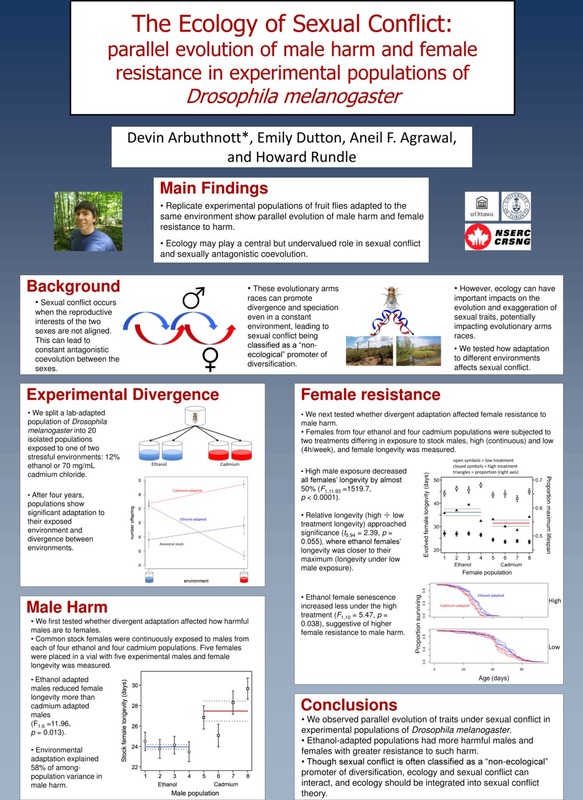 Contrary to previous theory, we find no evidence that females have highest resistance to the harm of coevolved males. 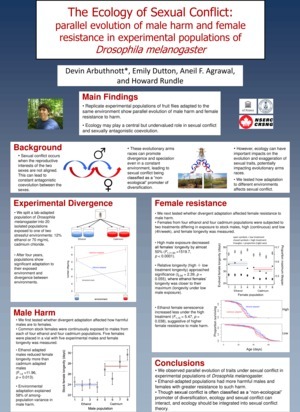 However, we do find evidence for parallel evolution of male harm and female resistance to male harm, as measured through female lifespan and senescence rates, associated with adaptation to these alternative environments, suggesting that sexual conflict may be predictable based on ecology. Ecologically-induced parallel evolution of traits under sexual conflict may have large impacts on how populations adapt to new environments, and how new species are formed, and ecology must therefore be integrated into considerations of sexually antagonistic coevolution. Differences in condition among individuals arise from both genetic and environmental variance in their acquisition and/or assimilation of resources. Such variation in condition can weaken or otherwise obscure the physiological trade-offs among competing life history traits that are thought to necessarily arise from the allocation of finite resources. The nature and extent of among-individual variation in condition will therefore determine whether life history traits co-vary positively or negatively and is therefore central to our understanding of life history trade-offs. Our understanding of condition-dependent trait expression derives almost exclusively from environmental manipulations, yet it is the underlying genetic basis of condition, and the pleiotropy this generates among life history traits, that may have fundamental evolutionary consequences. A comprehensive understanding of life history traits, their trade-offs, and their evolution, will therefore require a detailed knowledge of the impacts on trait expression of both environmental and genetic variation in condition. Here we use a two-way factorial design to provide some of the first experimental data comparing the effects of diet and mutation-accumulation (i.e. environmental and genetic) manipulations of condition on a suite of sexual displays (epicuticular pheromones) and morphological traits in Drosophila melanogaster. Our results reveal that condition is multi-dimensional, with the effect of the environmental manipulation being almost orthogonal to that of the genetic manipulation for both sets of traits in both sexes. Only body size showed concordant effects of diet and mutation accumulation. This suggests that environmental manipulations alone may provide misleading insight into condition-dependence and its effects on the expression, evolution, and trade-offs among competing traits.